Epicurus says: 'In my illness my conversations were not about the sufferings of my poor body, and I did not prattle on to my visitors in this vein, but I continued to discuss the cardinal principles of natural philosophy, with particular reference to this very point, how the mind shares in such disturbances of the flesh while still preserving its calm and pursuing its own good.' He goes on: 'I did not allow the doctors either to preen themselves on any great achievement, but my life continued fine and proper.' An example, then, for you in sickness, if you are sick, and in any other circumstance. All schools agree that you should not abandon philosophy in any eventualities of life, nor join the ignorant chatter of the uneducated layman. Concentrate only on the work of the moment, and the instrument you use for its doing. A movie about Winston Churchill is currently in the move theaters. The movie is called Darkest Hour. It is focused on the time period between when Germany invaded Poland in 1939 and when England was desperately trying to get her troops out of France at Dunkirk (which there was also a movie recently released about those events ... Dunkirk). There is one scene in Darkest Hour where Churchill takes the subway and talks to British citizens. Up to this point, he's been told on all sides that Britain needs to concede to Germany and sue for peace. But he strongly believe Britain needs to fight back ("you cannot negotiate with a tiger when your head is in its mouth!"). As he's on the subway, he gets a taste of the British spirit and sees that her people are willing to fight Hitler and his Nazi thugs. The rest is history. Britain fights on and is the only nation to fight Germany for the entirety of World War Two. After the events of Dunkirk, the Battle of Britain began. The Luftwaffe bombed London and other parts of Britain. But the British endured and showed the world their "stiff upper lip." It was in this time period (1939-1940) when a motivational poster was printed, with the intent to raise morale. 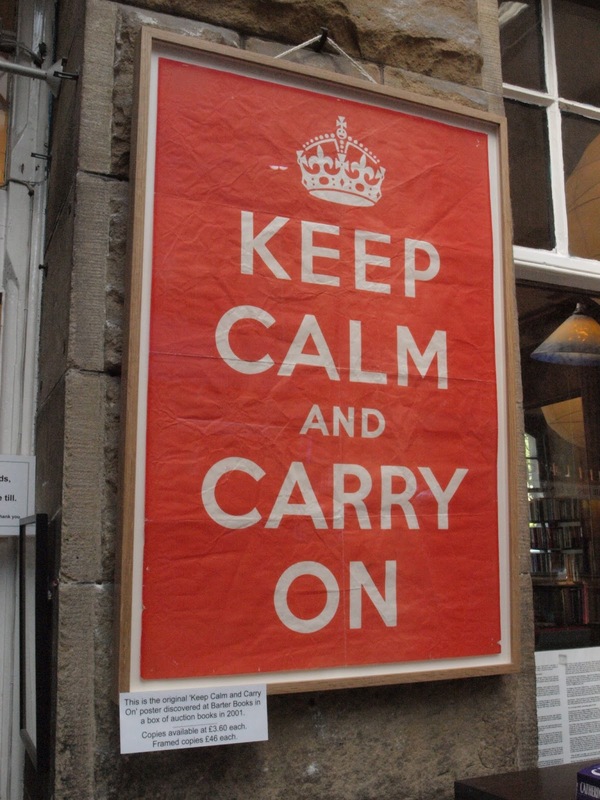 Although the poster was hardly ever publicly displayed, it emerged sixty years later and ignited the "Keep Calm" meme wave. What does all this have to do with Marcus Aurelius? In chapter 41 of Book 9, Marcus quotes Epicurus. The quote essentially says, don't complain about sufferings, rather talk about philosophy and virtue (if you're going to talk at all)! The one directive your mind should have, always, is to work in the present moment and your work should always engage the one instrument that makes you unique above all other things: your mind and it's ability to reason. If your city is being fire-bombed by Nazis, keep calm and carry on. If you are sick or have cancer, keep calm and carry on. If you have lost all your money, your job, your friends, keep calm and carry on. I'll wrap up this post with a poem from another British character. The poem is entitled Invictus by William Ernest Henley.